We can sum up the importance of timely action on roof leaks in two words – consequential damage. Water entering your building does way more than deteriorate the external components of the roof system. It even does more than shorten the lifespan of the roof itself. 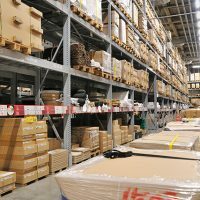 It can wreak havoc on your building’s interior, adding exponential costs and losses. That’s commonly referred to as consequential damage and it’s among the greatest potential expenses from a roof leak. Here are four ways it can negatively affect your buildings and the businesses inside. Water entering your building can naturally damage walls, floors and ceilings. Along the way it can also ruin equipment, inventory and furniture as well. Act quickly to determine the source and temporarily stop water from entering. Check the most common leak points first (cuts, tears, holes, open seams, and missing flashing) to find the issue. 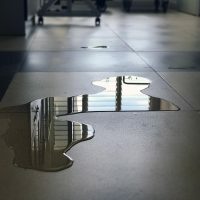 Moisture on the floor from a roof leak can cause slip and fall hazards throughout the building. That means it can put you at risk for worker’s compensation claims or customer lawsuits. Be mindful of slip/fall hazards and quickly have them remedied. Along with potential structural damage, wet insulation will contribute to higher monthly utility costs. When insulation gets saturated it’s nearly impossible to dry the trapped water and prevent the moisture from accumulating. The U.S. Department of Energy estimates energy losses caused by thermal resistance even from minor leaks can be as much as 70 percent. 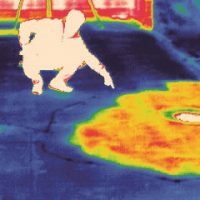 Use infrared scanning to catch wet insulation before it becomes a costly problem. If any is found, remove it and replace it with the same R-value thickness. 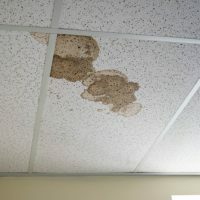 Moisture from a roof leak can serve as a source for mold and bacteria growth, as well as attract cockroaches and other insects. Costs to mitigate mold or exterminate insects can add up if not dealt with timely. Building code violations, business operation interruptions and even public relations messes are other likely outcomes.